The Fralin Museum of Art, U.Va. 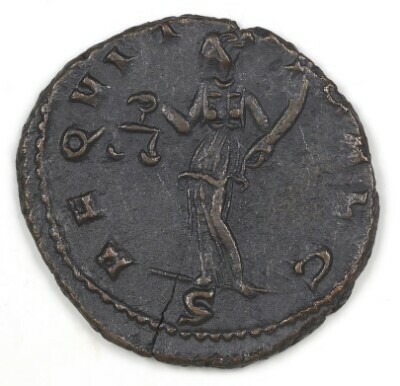 : Antoninianus of Claudius II Gothicus, Mediolanum, 268-270. 1987.46.30. 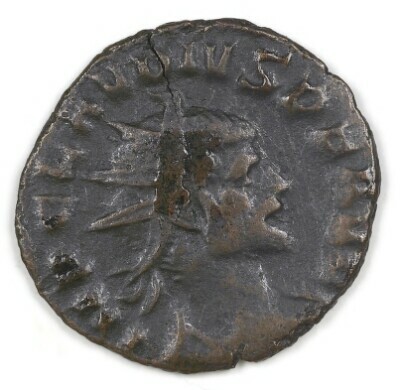 Antoninianus of Claudius II Gothicus, Mediolanum, 268-270. 1987.46.30. الوجه: IMP(ERATOR) CLAVDIVS P(IVS) F(ELIX) AVG(VSTVS) - Radiate head, right, draped. الظهر: AEQVITAS AVG(VSTI) - Aequitas standing left, holding scales in right hand and cornucopiae in left hand. 1987: Fifty-one coins were purchased from the Worldwide Treasure Bureau in 1987. According to Samuel E. Cox of the WTB, this selection of coins represents the top 2% of the hoard in terms of condition. 1985: A hoard of third century antoniniani numbering about 47,000 was discovered near Normanby, Lincolnshire, England in December of 1985. From 1985-1987, the hoard was processed by The British Museum under the direction of Roger Bland.